State censorship is being mooted by prominent Russians on state culture bodies aimed to restrain artists and theatres from 'controversial' ideas, so as to end what has been characterised as a post-Soviet stream of unhindered 'vulgarity and filth' pouring out of Russian cinema and theatres. A proposed 'conflicts' committee has been proposed by a leading theatre director and state representative, envisaged as a collective council of hand-picked heads of opera houses, theatres and arts training institutions, chaired by the outspokenly interventionist and conservative Culture Minister, Vladimir Medinsky, who would decide as a group what was or was not permissible on a countrywide basis. This first of two reports from the leading news agency Interfax appears to be pushing the Bolshoi's notably independent-minded chief Vladimir Urin into a corner, reporting that he is in favour of the suggested committee, when the reported words don't quite say that and it is unclear as yet what status the proposal has. Any such censorship committee could cause him, of all people, problems of authority within the Bolshoi itself and of standing in the world as an autonomous intendant of a major world opera and ballet house. The likelihood that the proposed make-up of the mooted 'cultural conflicts' committee might include Urin's longtime rival for his job, Nikolai Tsiskaridze, as the Rector of the Vaganova Ballet Academy, and that Urin's own artistic judgments for the Bolshoi could be overridden, if found too 'vulgar' or even 'filthy' by a conservative majority, make this political development an alarming one on principle alone. Added to the sternly pro-censorship opinions mooted in the second Interfax news report (which I've translated below the first) uttered by the chairman of the State Culture Committee, the development points towards a renewal of pressure for state ideological control of the arts which leading arts creators have been fearing. Urin himself defied the institutional conservatives who succeeded in hounding a controversial production of Tannhaüser out of Novosibirsk's robust opera house by promptly hiring its young director Timofei Kulyabin to stage Don Pasquale at the Bolshoi this year. The Siberian opera house's general director Boris Mezdrich was sacked by the government for allowing the staging. The concept of a 'conflicts' committee could be directly relevant to suppressing or approving this kind of action, as well as films such as Leviathan, Andrei Zvyagintsev's Oscar-nominated 2014 epic which attacked contemporary Russia, and extensively used the traditional expletive lingo known as mat. Mat has now been officially banned by the government from all scripts. I fancy (perhaps wrongly) that Urin is trying to find wriggle room - just as I fancy he did the other day when talking about the possible return to the Bolshoi stage of the dancer convicted of the acid attack on the ballet director. I've tended to have faith in Urin as an open-minded and seasoned operator in exceedingly tricky circumstances, and he looks to me to have been without doubt the saviour of the Bolshoi's reputation in the world over the past two years, when alternatives can easily be imagined who would have wrecked and polluted it even further. But it is likely to be on Urin's and his rivals' minds that his contract as the Bolshoi's chief runs out in 2018, and that within a few months it will be emerging whether the Culture Minister will authorise a second Urin term or replace him with one of the raring rivals more to the Minister's taste. What Urin answers at the moment to thorny questions on censorship or Dmitrichenko is likely to have some bearing on what happens. Bolshoi general director Vladimir Urin has spoken out in favour of the setting up of a special committee to discuss controversial issues in the theatre world. 'It is an entirely possible option. During the perestroika era, within the Theatre Union there was a similar conflict committee which dealt successfully with a whole range of controversies because it consisted not of officials but of people who actually worked in theatre, experts. It would seem to me that if it were this sort of committee, with people who have worked for many years in the theatre, and who have authority in the theatre world, there would be nothing wrong in establishing it,” he said. Earlier, at a joint session of the Russian Federation Presidential Committee for Culture and Arts and the Presidential Council for the Russian Language, the Alexandrinsky Theatre artistic director [and prominent theatre director] Valery Fokin proposed the establishment of a special committee to debate thorny issues relating to theatre productions. Fokin proposed that the council would be chaired by the head of the Theatre Union and Culture Minister Vladimir Medinsky. 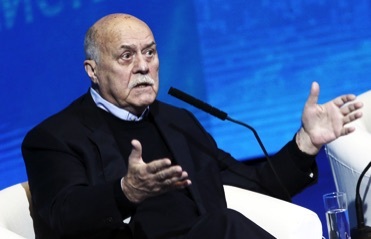 The chairman of the Parliamentary Committee for culture (film director) Stanislav Govorukhin has stated that Russia has no censorship, yet in his opinion specific moral limits in the arts are essential. “Of course there is none - not a trace,” he said in an interview with the TV channel Rossia 1, in answer to a question about whether Russia has arts censorship. 'In the 15 years into the early 21st century the level of morality (in Russian society) fell sharply, while all limits were swept away thanks to the fact that it was declared that the state could not interfere with the arts. So they did not interfere, and this has been a very bad thing,” he said. 'There can be no government in which there is no moral censure. As a rule, this would be society, the church and other institutions. But we do not even have this. We have the only Constitution in the world where it is written that any censorship is forbidden,’ said the film director. According to Golovukhin, it would be hard for the law to ancitipate every situation. 'For example, you can’t say a word of mat [IB: expletives] but a man can unbutton his flies and urinate at the front of the stage. This you can’t write down in law. There would have to be a core framework,’ he said.